The round brilliant cut diamond is the most popular and timeless of all shapes. In 1919, Marcel Tolkowsky, a Belgian mathematician wrote his doctoral thesis on diamond proportion and symmetry, which explained the ideal angles for a diamond to produce the highest level of brilliance and fire. The round brilliant diamond has been perfected with 58 facets and offers the most sparkle compared to any other diamond shape. 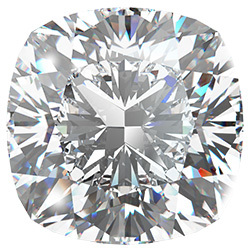 Today, more than 75% of all diamonds sold worldwide are round brilliant cut diamonds. Princess Cut Diamond is a square or rectangular shaped brilliant cut with sharp corners. It is a relatively new diamond cut developed in the 1960s, which was later perfected and named ‘princess cut’ around 1980-1981. 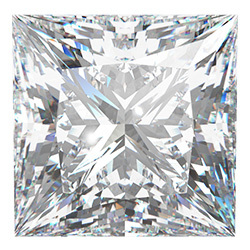 Princess cut is a unique and distinctive alternative to the popular round brilliant. The cushion cut is a timeless cut that has earned its name for its pillow shape. The cushion cut diamond has been around for almost 200 years, created around 1830’s. While the classic cushion cut diamond is square, it is also available in a rectangular shape. Cushion cut diamonds tend to have impeccable brilliance and are one of the best cuts to show off the beauty of fancy color diamonds. The emerald-cut diamond is one of the oldest diamond shapes, with origins tracing back to 1500s. Emerald cut diamonds have anywhere between 50 to 58 facets. This cut has rectangular facets step-cut into the diamond’s pavilion giving it a unique and elegant appearance. Emerald cut diamond requires higher quality of color and clarity, because inclusions seem more apparent. Since earning its name in 1920s, emerald cut have remained one of the most popular choices for engagement rings. The pear shape diamond was created in 1458 by a Flemish diamond polisher, Lodewyk Van Berquem in Brugge, Belgium. 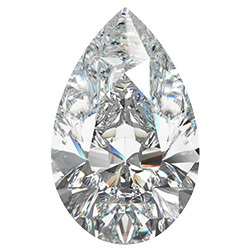 The pear shape diamond is also referred to as a “tear-drop shaped diamond”. 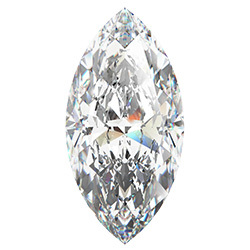 A round and a marquise cut combine both of their brilliance and designs into one unique shape. A pear shape diamond makes the fingers appear to be longer, making it a great choice for an engagement ring. 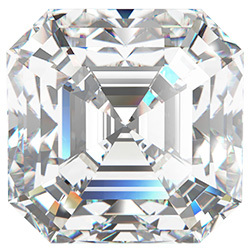 The radiant cut was designed by Henry Grossbard in 1977 and gained its popularity in the 1980s. 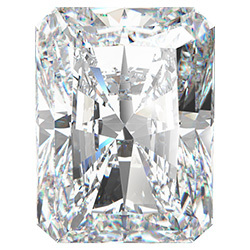 Radiant cut diamond has 70 facets and can either be a square or rectangular shaped. It is considered a modified brilliant diamond, which combines the sparkle of the round brilliant cut and the elegance of the emerald shape. Radiant cut diamond has carefully beveled corners and substantial durability against chips and breakage which makes this cut an excellent choice for those with an active lifestyle. Oval cut diamond was invented in the early 1960s by a leading Russian cutter Lazare Kaplan. 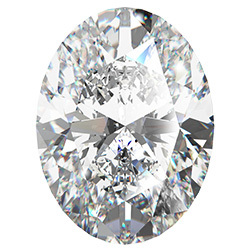 Oval cut has the same amount of facets as found in a round brilliant cut diamond, but it has a longer shape. 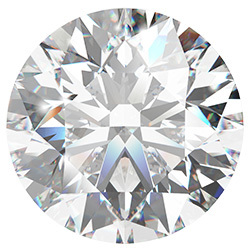 The cut and facet design of an oval diamond provides roughly 10 percent more surface area which gives the appearance of a larger diamond in the same carat weight. It is an attractive choice for modern or vintage engagement rings. The Asscher cut diamond was created and named by Joseph Asscher in 1902, at the beginning of the Art Deco period. In 2001, almost 100 years later, Joseph’s great-grandchildren Edward and Joop Asscher introduced the Royal Asscher cut featuring 16 more facets than the original cut. This diamond is one of the very first patented diamond cuts in the world. 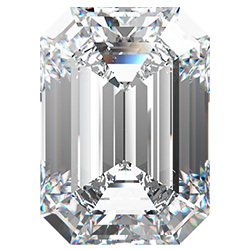 What sets an Asscher Cut apart from an Emerald Cut is the greater total depth of the diamond, its increased number of facets and the square shape. The Asscher cut has recently gained popularity, especially amongst celebrities. It appeals to those wanting a diamond that is out of the ordinary. 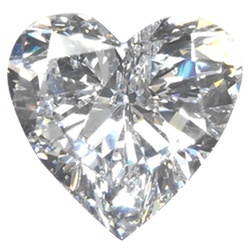 The heart shaped diamond is considered the most romantic of all diamond shapes. It features 59 triangular and kite shaped facets, each one polished to perfection to achieve the maximum amount of brilliance similar to a round brilliant cut. Heart shaped diamonds were first mentioned between the infamous Duke of Milan, Galeazzo Maria Sforza, and Nicodemo in 1463. In 1562, Mary Queen of Scots sent a heart shaped diamond ring to Queen Elizabeth. Heart shaped diamonds were exchanged between royalty for hundreds of years as a symbol of good will and friendship. Heart shaped diamond is an ultimate symbol of love and romance. It is a lovely gift idea to celebrate a special occasion or Valentine’s Day. The Marquise cut diamond first appeared in Paris circa 1745, created for Louis the XIV, a monarch who ruled as the King of France. King Louis XIV instructed his jeweler to design a brilliant cut diamond that resembled the smile of his beautiful mistress, the Marchioness Madame de Pompadour. It is also known as the “Navette” shape, meaning little boat. Marquise Brilliant cut diamond gained popularity between the 1960s and 1980s. Because of its elongated shape, the marquise cut diamond gives the appearance of longer and more slender fingers. My dad bought a Christmas gift for my mom from there, I went in with him great service. Odds are if/when I decide to get married I will go there.